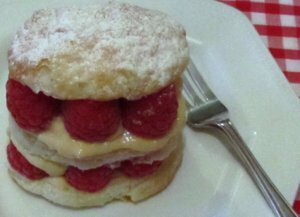 A Puff pastry recipe to make the most delicious and popular pastry, everyone loves!. But are you afraid to make it? – yes, many people are. It is so sad to think it is the one pastry most people are afraid to make at home. Of course everyone is very busy these days and it is far easier to pick up a packet of frozen puff pastry from the supermarket - I have done it myself! But once in a while, for that special occasion, or just a comforting treat, you can make your own and then you will really see the difference - it's gorgeous. When you have made your puff pastry this way you will never want to buy it again! It is quite easy, needs a little time but if you make it ahead you will have the best, tastiest pastry you have ever made. It can be used for desserts or savoury dishes, so is very versatile. To begin with make a small amount and see how much this will make for you. You can always increase your ingredients and make as much as you want. 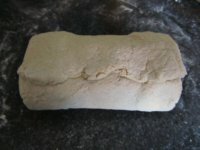 · Add the water and mix to a dough. · Leave to rest for about 15 minutes. 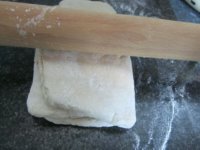 Roll the dough into a square about 8 inches and place the butter in the centre. Fold in three then roll again. Fold the edges of the pastry over the butter. Leave to rest for 10 minutes. Roll to an oblong. Leave the pastry to rest again. 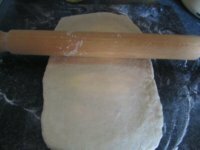 · Repeat the above another three times and rest the dough in the refrigerator for 10 minutes, or until you need to use it. 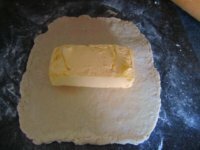 · Basically, rolling the pastry will distribute the butter throughout it. The butter must be softened just enough to allow you to roll it in the dough. If taken out of the refrigerator for a short time before use it will be just right. It will keep for a few days in the refrigerator or can be put in the freezer until you need it. And there you have your wonderful puff pastry – homemade with no additives and it will certainly be a winner with all your family and friends!